In 1824, an obelisk was erected some eleven miles north of the Observatory at Chingford for use as an additional northern meridian mark with the Troughton 10-foot Transit Telescope. The land on which it stood was leased by the Admiralty on behalf of the Observatory for a period of 99 years. During this period, its maintenance and upkeep were the responsibility of the Observatory. As such, even though rarely visited in person, it can be regarded as the earliest of the Observatory’s outstations. A transit telescope is a specialist instrument mounted between two piers in such a way that it can only rotate in the plane of the meridian (north-south line) passing though its centre. The meridian of a transit telescope was nearly always established in the first instance from observations of the circumpolar stars. These stars are always present in the sky and transit (pass over) the meridian twice each (sidereal) day as the Earth spins on its axis. When a transit telescope is correctly aligned, the measured time between successive transits of a given circumpolar star is constant. If a good catalogue was to hand, the right ascensions of a high and a low star could be used instead. Once a transit telescope had been adjusted to the meridian, it was possible to create a mark on the horizon for use as a quick alignment check. With the existing northern mark erected at Blackwall in 1816 often rendered invisible by the rigging of ships or mists from the Thames, John Pond, the Astronomer Royal sought to erect an alternative. 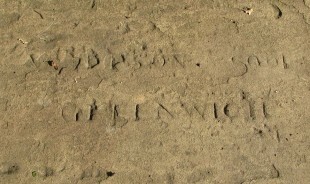 In July 1819, it was ‘Ordered that Colonel Mudge be requested to assist the Astronomer Royal in carrying into effect the establishment of a permanent north meridian mark.’ Three years later, on 4 July 1822, the Observatory’s Board of Visitors resolved ‘That the Astronomer Royal be requested to apply to the proper persons to obtain an estimate of the expense of erecting a granite column upon proper foundations for a meridian mark, and to ascertain the conditions upon which the proprietor of the land will consent to the erection and that he do report the same to the council’. The Minutes of their meeting on 14 November 1822 show that the terms agreed were ‘fifty pounds for a long term of years at a peppercorn rent and the lessen to be paid for any damage that may be done to the land in carting materials over the same.’ The minutes of the meeting on the 13 February 1823 give the estimated cost of erecting the granite obelisk as fifty pounds. However, when the final bill was presented, it came to one hundred and seventy six pounds, fifteen shillings and two pence (Royal Museums Greenwich ADM/BP/45). 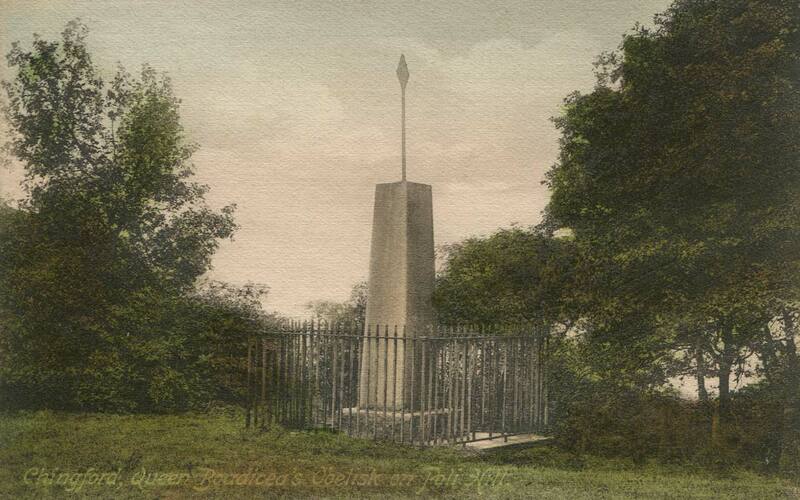 The first recorded observation of the obelisk was made on 28 March 1824. The land on which the Obelisk stood belonged to the Lord of the Manor of Chingford St Paul, who at that time was the Reverend Thomas Snell of Windelsham. It was he who leased it to the Right Honourable Robert Viscount Melville (First Lord of the Admiralty) and Sir William Johnstone Hope in their capacity as commissioners of the office of the Lord High Admiral. 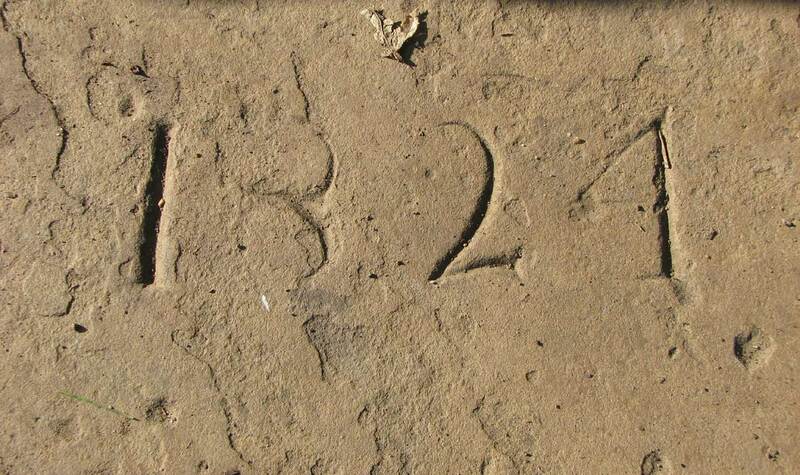 Dated 7 July, 1825, the indenture granted a 99 year lease commencing Lady Day (25 March) 1825 for the plot on which the obelisk stood together with the right to access it at all reasonable times in order to carry our repairs. The amount payable was £50 plus an annual rent of one peppercorn if demanded. 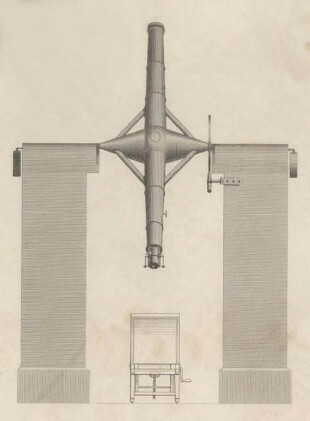 The Observatory held no copy of the lease nor any other information about what arrangements had been made, until Airy requested a copy of the lease from the Admiralty after making a visit to the Obelisk in April 1839. It was subsequently filed with other papers on the Observatory Buildings and Grounds (RGO44/147–48). In 1923, it was decided not to renew the lease and it was allowed to expire. Before any attempt was made to erect a granite obelisk, a temporary mark was erected. It seems likely that communications between Greenwich and Chingford would have been carried out using a system of flags in a manner perhaps not dissimilar to that described by Revd. Weld in his account of placing meridian marks for the Stonyhurst transit circle in 1851. 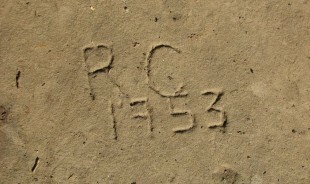 A temporary mark was clearly in place by the summer of 1822 as it was selected as one of the stations in a trigonometrical re-determination by Captain Kater of the difference in the longitudes of the Greenwich and Paris observatories. In the autumn of that year, the mark was removed by Kater, and ‘a staff was put up in its place, having a triangular board fastened to it, the base of which was parallel to the horizon, and the vertex coinciding with the staff … The angular distance from the meridian to the staff was then measured by means of the micrometer of the transit instrument [at Greenwich] … By means of the roughly computed distance from the Royal Observatory to Chingford, and its angle with the meridian, the distance of the station from the meridian of Greenwich was found to be 20 inches’. Kater later positioned an Argand’s lamp on the Meridian and asked Pond to observe it from back in Greenwich to confirm the accuracy of its placement. This observation, which is recorded in Greenwich Observations, was made on 15 November 1822. 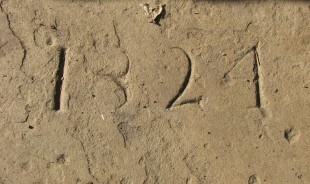 Kater later marked the site with a piece of Portland stone about one foot square and four or five feet long that he had procured for the purpose. It was sunk endways until level with the ground and had the word ‘station’ along with the year cut into it. Kater gave the latitude of the Chingford station as 51°38’ 9.59” and its distance from the centre of the transit instrument as 57,847.66 feet. 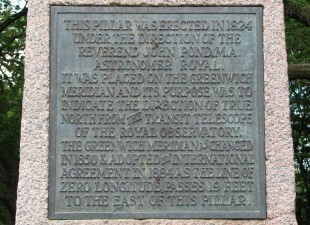 The station was used again between 19 April and 29 May 1848, at which time, its location was recorded as: ‘13.54 feet from the centre of the Greenwich north meridian mark, 9.67 feet from the south-west corner, and 10.12 feet from the south-east corner of the base of the obelisk;’ and as being marked by ‘a round hole bored in a square stone’. Whether or not this stone still survives in the ground has not been possibe to establish. 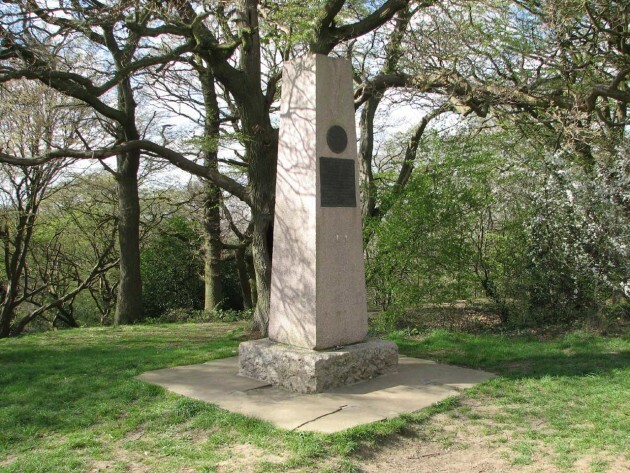 In 1869, Airy reported that the Obelisk was ‘now backed by [the] trees of Epping Forest, and, when it is to be used, it will be necessary to attach to it a lofty pole.’ The following year, he reported that he had since discovered that the trees belonged to Richard Hodgson, late secretary of the Royal Astronomical Society, (who had become Lord of the Manor following the death of Snell in 1843), and who had given a spontaneous ‘undertaking that the trees shall be cleared away whenever it shall be necessary, to the extent that may be required to make the Obelisk visible’. In later years, (after 1869), it was probably the Ordnance Survey who found it necessary to add the pole with an arrow head that can be seen in the image at the top of the page. It was probably after this point that it became known for a while as Queen Boadicea’s Obelisk. The railings are no longer present having been removed at some point prior to 1934. 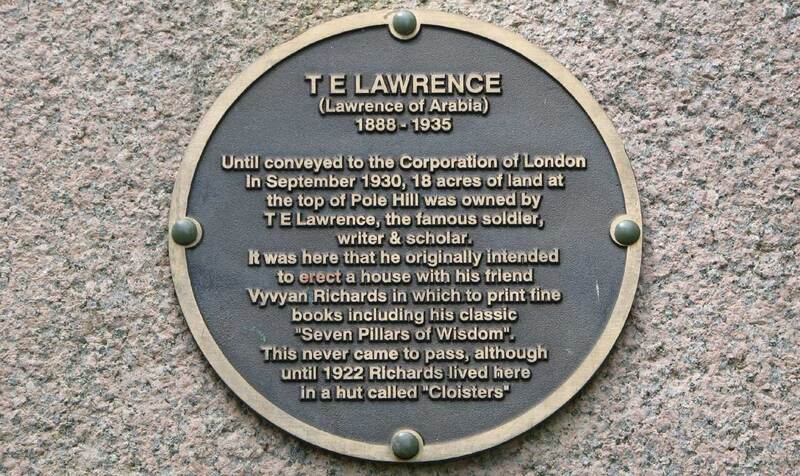 The erection of the plaque coincided with the start of the retriangulation of Great Britain for which a nearby trig point was erected. 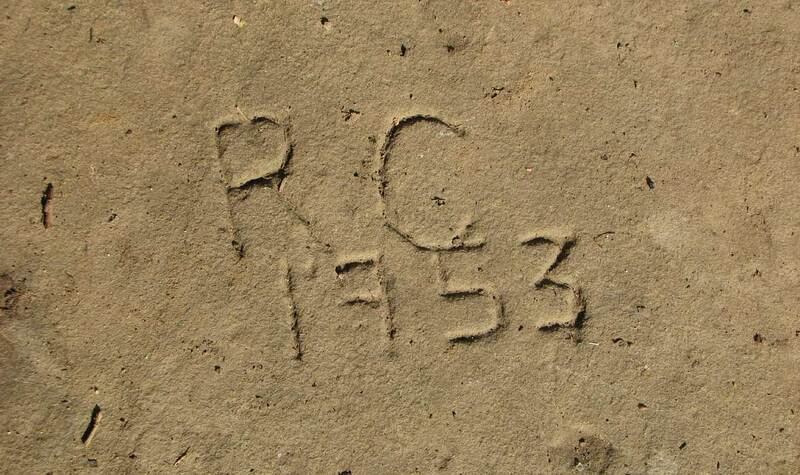 The mark was brought briefly back into use in 1953 when triangulations were being carried out to fix the position of the new instruments that were being set up at the Observatory’s new home at Herstmonceux . A priority for both the Astronomer Royal and the Ordnance Survey was to fix the precise co-ordinates of the Cooke Reversible Transit Circle and other instruments at Herstmonceux relative to the Airy Transit Circle at Greenwich. Although the Observatory was moving, the Prime Meridian wasn’t. Nor was there going to be any alteration to Greenwich Mean Time. By knowing the precise locations of the meridian instruments at Herstmonceux, offsets could be applied and the continuity of the Greenwich Time Scale maintained. The coordinates were fixed though two programmes of observations; one astronomical, the other trigonometrical. 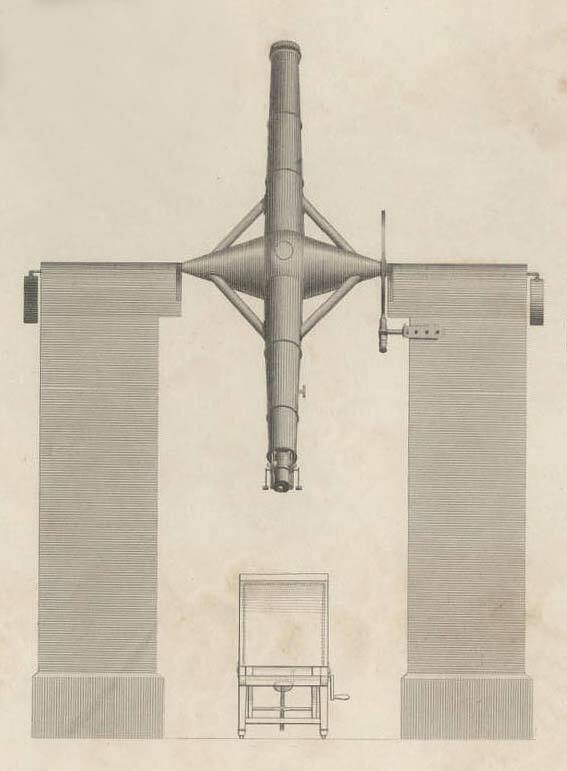 The trigonometrical procedure involved a programme of observations at Greenwich with the Airy Transit Circle of the Chingford Obelsik, along with the erection of a special azimuth mark for the telescope at Herstmonceux and several triangulation pillars (trig points). Observations were made with the Airy Transit Circle during the periods 8 June to 7 August, and 11 September to 9 October. This was the first and only time that the Airy Transit Circle was used with a Meridian mark. 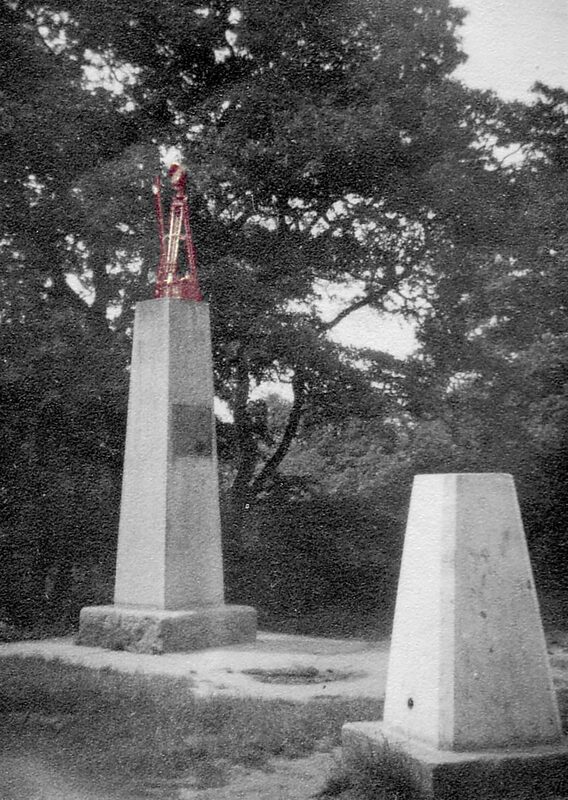 Click here to read more about these observations of the Chingford Obelisk. 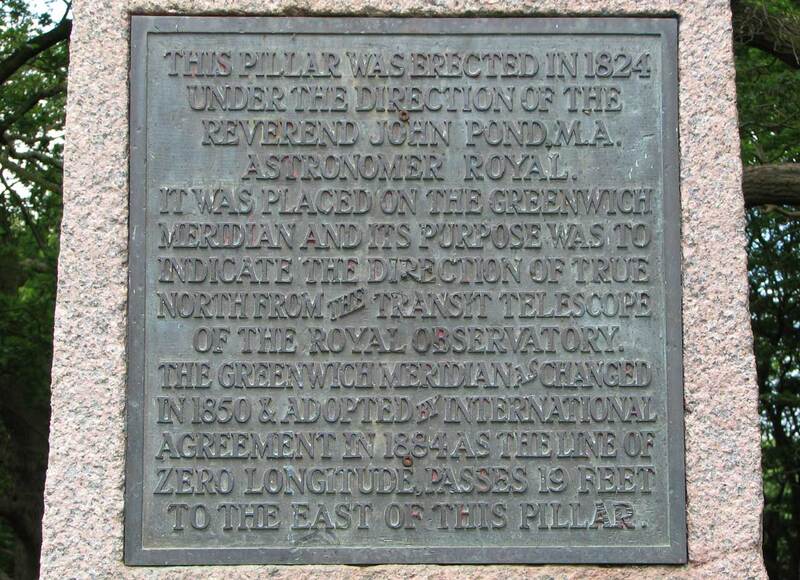 Click here to read more about the history of the use of Meridian marks at the Observatory. 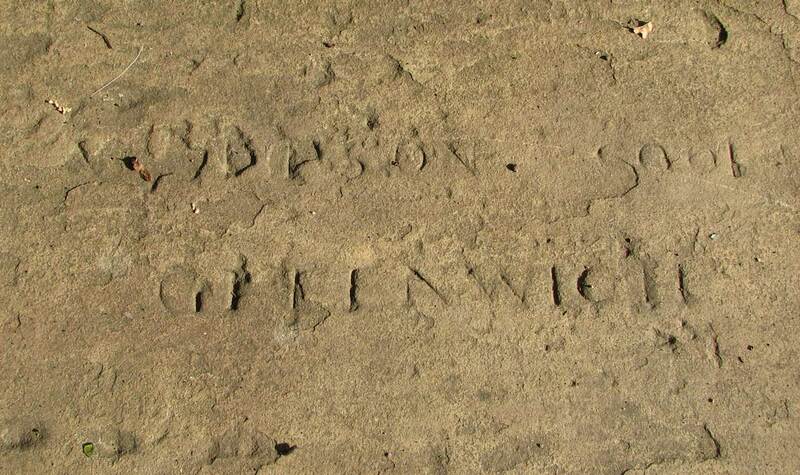 The York stone paving surrounding the base of the obelisk carries a number of inscriptions, dating back to 1824. They are easiest to see when lit by the Sun when it is low in the sky. 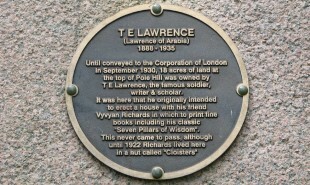 A plaque commemorating the writer TE Lawrence (Lawrence of Arabia) was added in 2008. The Meridian laser marks the route of the Greenwich Meridian by night in a northerly direction from the Royal Observatory. Under good viewing conditions, it is visible at a distance of over 36 miles with the naked eye and over 60 miles with binoculars. Titled 0 Degrees, and the work of artists Peter Fink and Anne Bean, the laser was ‘unveiled’ on 1 May 1993. In 1999, a replacement Millennia VS Diode-Pumped, cw Visible Laser was installed. In the past, the obelisk has been used as a guide to check and adjust its alignment. 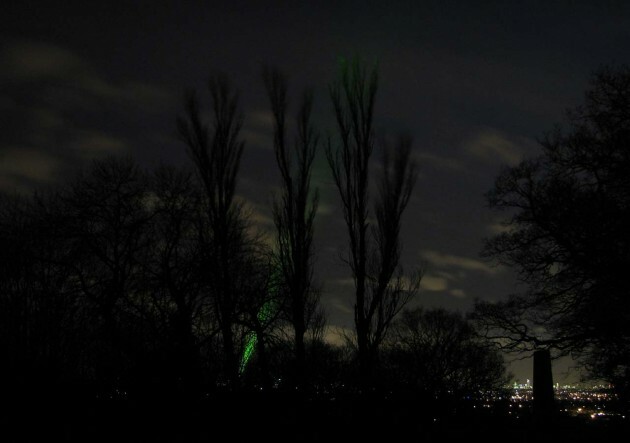 This was done by an observer standing 19 feet to the east of the obelisk on the Airy Meridian and ensuring that the beam passed directly overhead and just cleared the tree canopy. The construction of the Stratford Plaza on the Airy Meridian between 2012 and 2015 necessitated increasing the elevation of the laser to prevent it from striking the building. The beam had to be raised again as a result of the taller Stratford Central being built between 2015 and 2018. The view of the Obelisk from either the Troughton Transit Telescope or the Airy Transit Circle was blocked by the building in 2007–08 of Elektron Tower 1, some two miles from the Observatory at Blackwall. It was thought by the architect that the building would stand on both the Airy and Bradley Meridians. 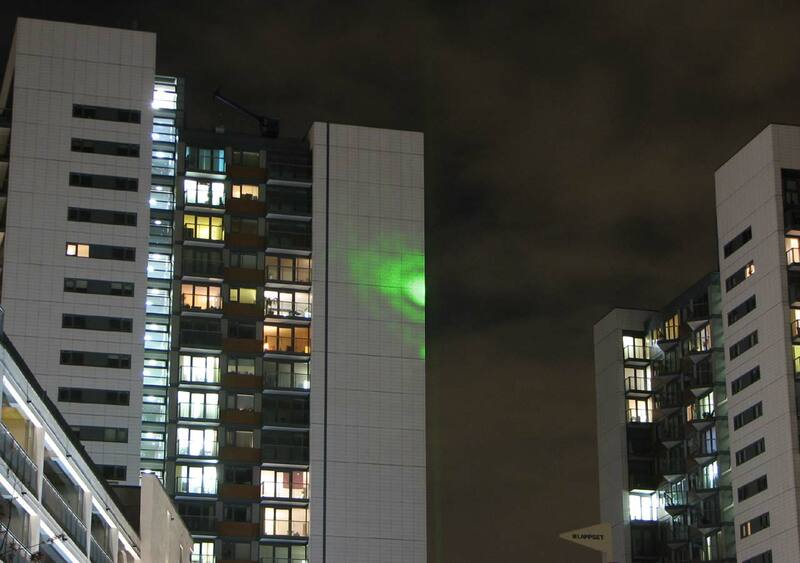 As things turned out, the architects got their calculations wrong and although the building did prevent the obelisk from being seen, the Meridian laser was largely unaffected. The obelisk is a listed structure (grade 2). Listing date: 24 February 1987. Click here to view listing details.